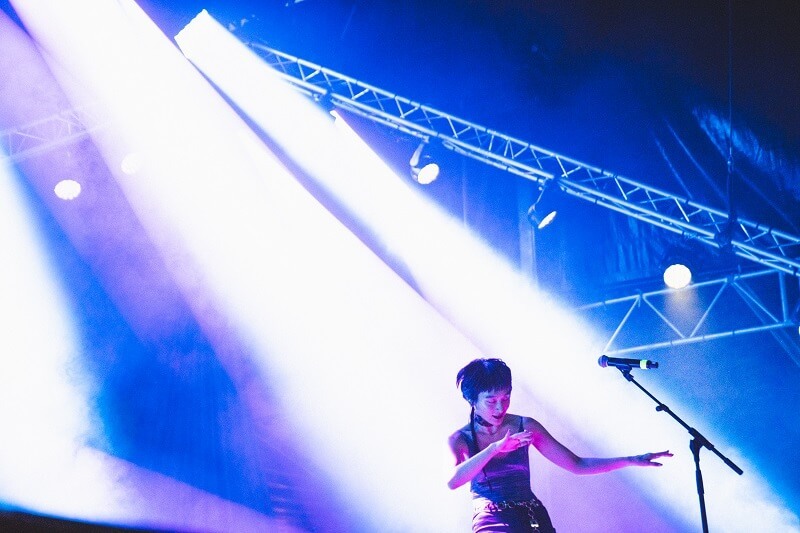 Wednesday Campanella made their first ever appearance at the music festival Les Eurockéennes de Belfort, which was held in Belfort, France. This year will mark the 30th Les Eurockéennes de Belfort music festival. This year it took place at the protected natural park Malsaucy and ran over the course of four days. 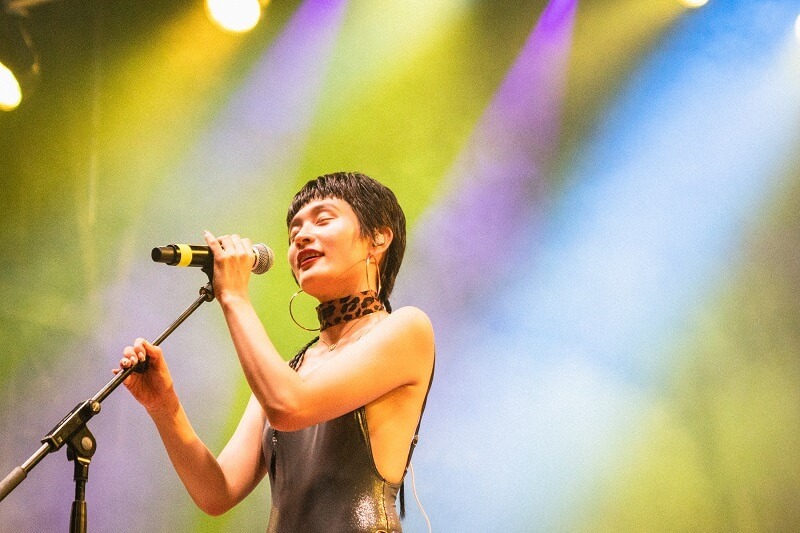 Wednesday Campanella took to the “Loggia stage” on the third day of the festival. 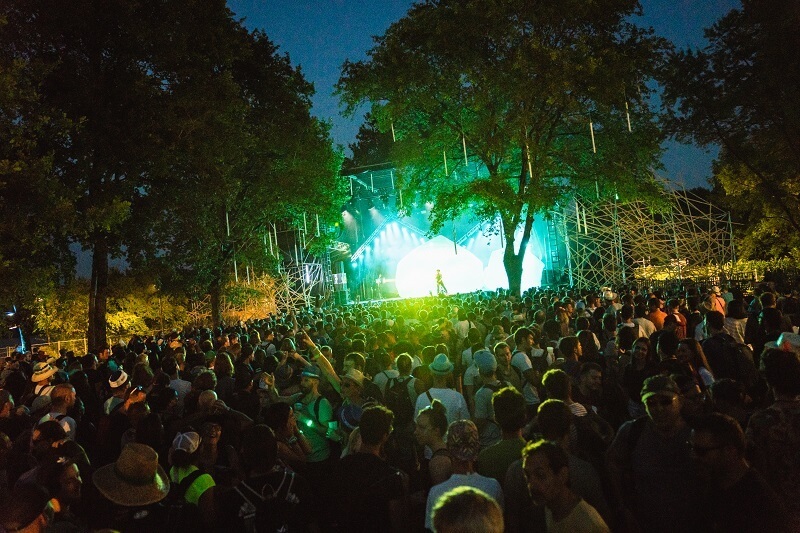 This year, the third day entertained approximately 30,000 people and approximately 135,000 gathered at this large festival over the course of the four days. As the introduction to their first song “Eisei” started, the audience gathered closer to the stage, and singer KOM_I appeared before them. 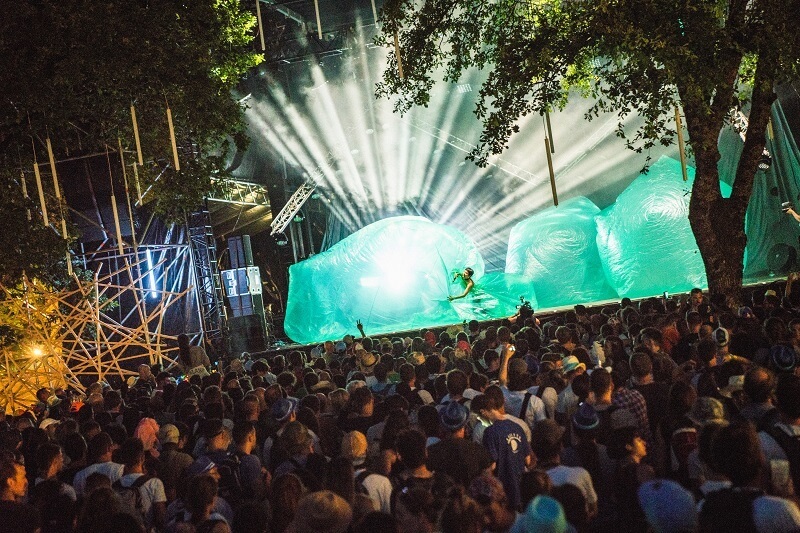 During the remix of Momotaro, a large sheet appeared onstage, filling the air and flowing like a wave. KOM_I was swept into the centre, shaking it about whilst dancing and singing. French dancers took part in her performance of Uranchan, dancing a rhythmical dance alongside KOM_I. 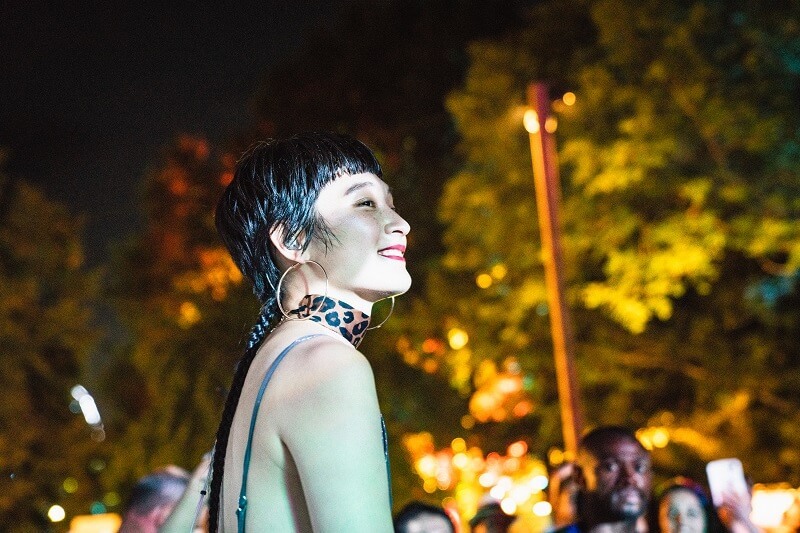 KOM_I then took a pause to introduce herself to her audience. “Hello! 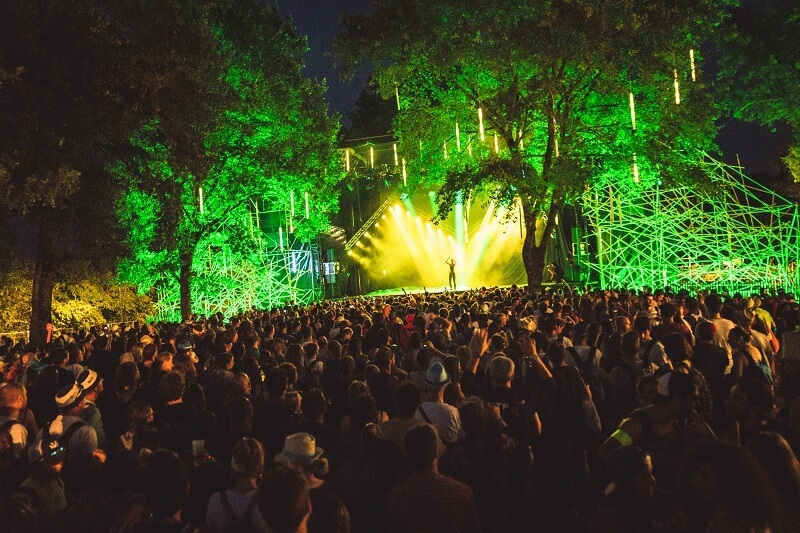 We are Wednesday Campanella”, she announced, greeting the audience in French and causing a roar of approval. 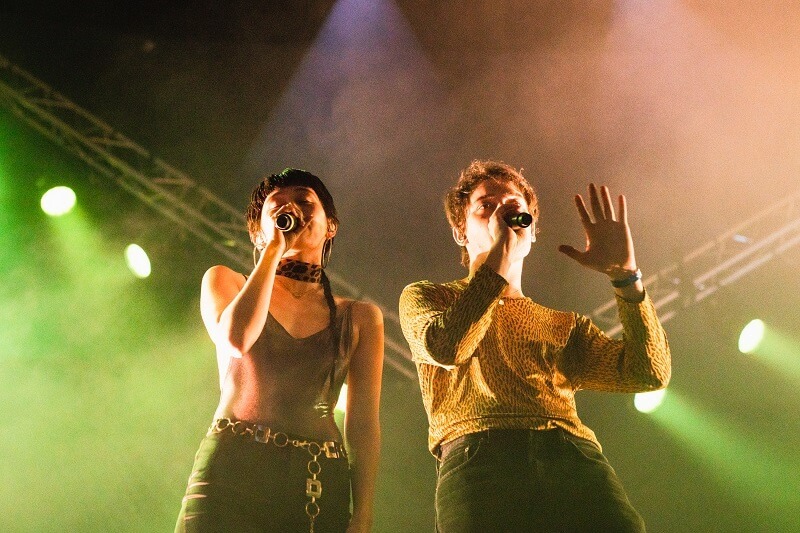 “Today I’ve come along with a friend – is it alright if I call them on stage?” she said, and with that, French band Moodoïd appeared and they performed their collaboration song “Matryoshka”. Later, they performed “Yuta”, during the start of which two large, transparent green balls appeared and KOM_I entered into one of them. The balls were illuminated so that the audience could see her silhouette as she entertained the crowd. Afterwards, Wednesday Campanella moved on to performing “Minakata Kumagusu” and then “Mizaru, Kikazaru, Iwazaru”, which heightened the spirits of the audience, who couldn’t help but dance along. KOM_I shouted, “let’s sing together!” and the audience joined in. During the last song “Marco Polo (Remix)”, once again, a large inflatable balloon was thrown onto the audience and KOM_I climbed to a slightly elevated platform at the side of the music booth to bid farewell to the audience. She left barefoot and with that, the performance came to a close. After the live performance, we asked a front row French audience member what they thought of the show. Their response: “It was the best! As a fan of Japanese music, I’m constantly looking at loads of Japanese songs online. I discovered Wednesday Campanella two years ago and immediately became a fan – now they’re my favourite band. Today was my first time seeing them live and I can’t express just how happy I am. Her songs are so upbeat that you surge with energy – it’s like having the energy of a school child again! “they said. Next, Wednesday Campanella will travel to Poland to take part in the “OFF Festival 2018”. The band are also preparing for their “Galapagos tour” around Japan.